First on the right is "Les Cheminots". Particulary I liked very much this one because they have a lot of rolling stock in N and HO scale. Also there's a bargains vitrine, impossible to avoid buying something from. In my first visit I took a chemical transportation tank from the old french company Rône-Poulenc at a bargain price, and the first set of the Venice Orient Express. Yes, I collect japanese rolling stock.... but I love tank cars from all over the world, and the orient express is a jewel than once arrived to Japan... so why not?? This Arnold set is really wonderful, but I have to admit it doesn't move as smooth as other cars. May be is just a question of oil and roll on some minutes, but just putted on track it's not as smooth as expected. 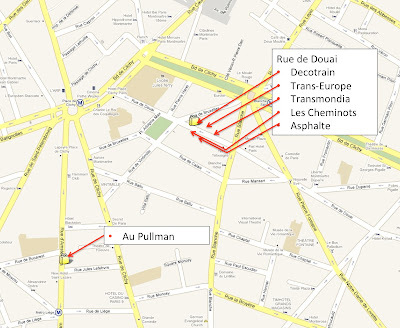 Next to this shops you can also find Transmondia, Trans-Europ Trains and Decotrain. The first one is also focused on N scale, while the others are more focused on HO and O gauge. If you search for old O gauge trains, don't miss them. Transmondia also has a lot of Kato and Tomix articles. In my second trip I was searching a cleaning vagon from Tomix, and the owner of "Les Cheminots" sent me directly to this shop. I found a special Tomix kit containing the cleaning car and also a wheel cleaning track. It seems a very good solution for cleaning wheels, not only of the locomotives, I'll write in a special post the tests. Finally I didn't bought only this Tomix set, but also the rest of Venice Orient Express set. Actually the second set consisting in two sleeping cars was out of production and sold out, but there's a 4 car set including the two cars from the old set. If you walk down to Rue de Amsterdan, there is another nice shop "Au Pullman". The storefront is decorated as a passenger car, and the quantity of rolling stock is also relevant. And finally, I tried to go to OfferLine. It was my birthday and I wanted to have my own gift, but Saturdays is closed!!!! So I cannot write any review about this shop, but surely next time. I'm glad you found the information useful! Too bad you didn't get to Oferline, its a nice shop, but it is on the other side of Paris - and I think quite unusual that they are closed on Saturday!!!! Looks like you did some good shopping! All the best, Jerry.